Copies of Action ship within 3 business days. Shipping/handling by U.S. Postal Media Mail: $4.00 for first copy and $1.50 each add'l. Action is a manual for the modern Catholic Crusader by one of the late 20th century's most respected and knowledgeable Catholic laymen. Jean Ousset, one of France's foremost scholars of the Revolution, and a leader of the European anti-Marxist movement, founded La Cité Catholique in France in 1946 to spread the Social Reign of Christ. 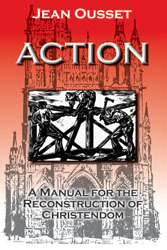 Action is one of his thorough and engaging -- yet practical -- manuals designed to inspire, motivate, and guide the modern Catholic layman in the understanding and performance of his duty to fight, with every available and lawful means, for the implementation of Catholic principles in society. Of particular interest is Ousset's thorough, well-documented, and balanced treatment of the relationship between the clergy and the laity in the struggle for the triumph of Catholic principles in the temporal order. Additionally, he makes a clear and commonsense case for when it is not only lawful but also imperative to collaborate with non-Catholics of good will for the implementation of the Church's Social Doctrine for the salvation of temporal society. No man of good will concerned about the state of modern society -- Catholic or otherwise -- who proposes to take some action in defense of what remains of Christendom can afford to be without this book. May God grant that it become a truly useful tool in the re-fashioning of a fervently and solidly Christian society. The IHS Press edition of Action is pleased to offer a short Preface by Mr. Anthony Fraser, and a comprehensive introduction by the Directors. Order copies for yourself and your friends and colleagues today!